Posted by M Bharath Bhushan in agitation, compromise, Economy, heritage, Hyderabad, KCR, Mulki, Osmania, politics, Settler, Telangana, TRS. Telangana chief minister K Chandrasekhar Rao has acquired a reputation for being a quick decision-maker, except that the decisions are rolled back just as quickly. Political rivals dubbed him “Rollback CM” after a series of decisions Rao took upon becoming the first chief minister of the country’s newest state in June last year were shelved under public pressure. “When a CM takes a decision, he should consider all the pros and cons beforehand. Rao is driven by momentary emotions. His decisions prove he lacks the maturity to head a state,” Mallu Bhatti Vikramarka, working president, Telangana Congress, told HT. Posted by M Bharath Bhushan in Culture, Economy, Identity, Osmania, Telangana. Giving a brief insight into the root causes of Telangana movement, civil rights activist G Haragopal has unveiled a vision of Telangana state for it to be an ideal state in the country. Delivering the second Acharya Konda Lakshman Bapuji Endowment Lecture on ‘Vision for New Telangana’, jointly organised by Osmania University and Acharya Konda Lakshma Bapuji Foundation, at the Osmania University here on Friday, Haragopal said the people of Telangana were confident of reconstructing Telangana as an ideal state. He said it was faulty economic development model adopted for Telangana that resulted in its backwardness. Elaborating further, he said the Green Revolution was based on water. “It benefited coastal Andhra but not Telangana. The waters of Krishna and Godavari were used to make the lands in coastal Andhra highly productive. Posted by M Bharath Bhushan in elections, Osmania, Telangana, universities. Hyderabad: The Telangana movement is all set to get a shot in the arm with scores of student leaders planning to step up their struggle after being promised tickets to contest the 2014 Assembly polls by various parties including the TRS, TDP and the BJP. The student leaders, who had been criticising political parties for taking them for a ride by promising them their due, seem to have buried the hatchet and are eager to take their struggle for statehood outside the university spheres. 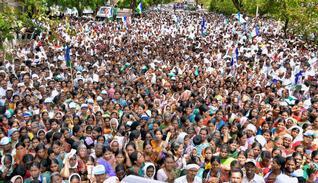 They came out in open support of their leaders, saying the move was the logical next step and are now setting up offices and rooting to reach out to their voters in the 10 Telangana districts. Posted by M Bharath Bhushan in Art, cosmopolitan, Culture, Deccan, heritage, Hyderabad, Identity, Nizam, Osmania, Telangana, universities. The architectural uniqueness stirs romance and the stunning structure blows the mind. 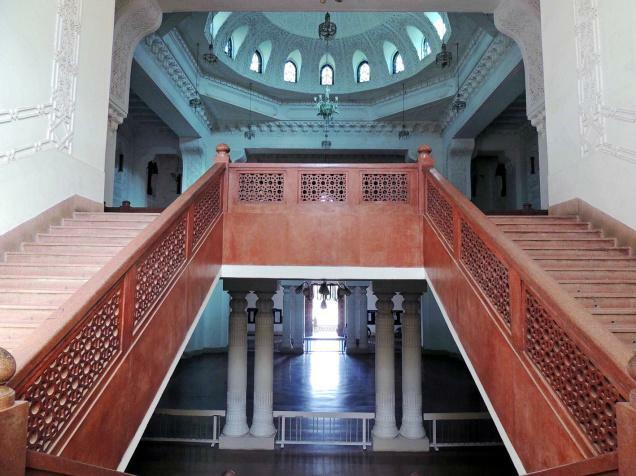 The unspoiled edifice reveals majesty and is the nucleus of the 95-year old Osmania University. This is the College of Arts and Social Sciences of the famed OU, popularly known as the Arts College. It is one of the major heritage structures in Hyderabad. A team of experts travelled around the world to find the right design and the right person who could design this historic masterpiece. The credit for the architecture goes to Monsieur Jasper, a Belgian architect. Jasper prepared a detailed plan of all the university buildings. The execution of the plans was done by Nawab Zain Yar Jung, who was later awarded a Padma Bhushan for his outstanding service to the field of architecture.